We’re taking ‘Going Green’ to a whole new level. Based on the government’s EnergyStar program, we have developed an exclusive new “GreenLean” building method that catapults us to much higher levels of energy efficiency and green building than even the EPA suggests. Our GreenLean homes emphasize not only energy efficiency, but also comfort, health, and earth friendliness. Using reverse architecture, GreenLean™ designs homes around green engineering from the very beginning. The other architectural elements then follow. Our process uses less lumber and produces 75% less construction waste. It’s no wonder why we were awarded the “Utah Energy Champion” award from the State of Utah and Energy Star! The Home Energy Rating System (HERS) Index is a system established to evaluate the energy-efficiency of a home. A score of 100 signifies a home built to the specifications of the HERS Reference Home (based on the 2006 International Energy Conservation Code), and a net zero energy home scores a HERS Index of 0. So, the lower the HERS score, the more energy-efficient the home is. Every GreenLean™ home has a HERS rating of 65 or less vs. a rating of 80 or above for many competitor’s homes. The use of less exterior studs combined with increased insulation value equates to reduced heat loss transfer and more insulation. As shown below, virtually NO heat loss is found in our GreenLean™ Thermal Break walls. A GreenLean™ home can save you as much as 50% on your utility bill! 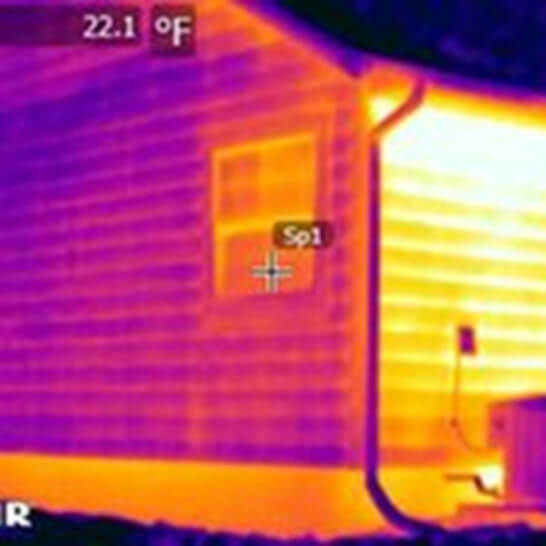 Thermal imaging can detect where homes are losing energy. 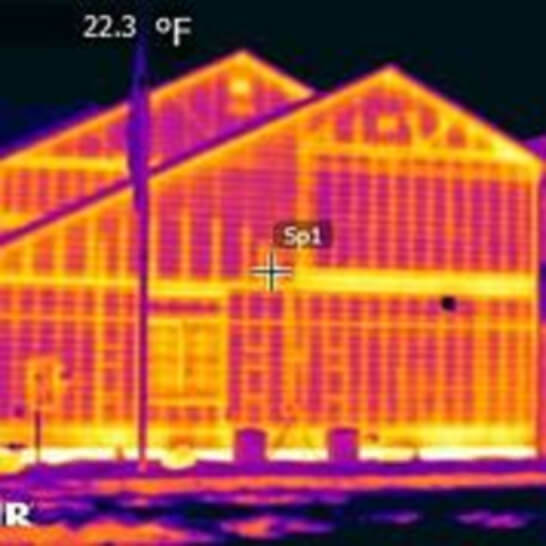 In this picture of a typical home, the light areas represent heat loss. Heat is escaping from each stud in the framing. GreenLean™ designed homes have a tighter exterior envelope and lose much less heat. This translates to more energy savings and money in your pocket each and every month you live in your home.